We’ve come a long way from hand-drawn network diagrams or a static network drawing tool. Advancements in network diagram software have allowed engineers to spend less time documenting their network and more time performing important network management tasks. Unfortunately, too many networks are still documented with outdated techniques. Dynamic network diagram tools were designed to overcome the challenges of a static network drawing tool. Dynamic network diagrams are created on-demand, instantly. Because our network maps are data-driven from the live network, they are always up-to-date. Through this approach, there’s no need to create and maintain a database of network drawings. On-demand mapping allows engineers to create a network diagram customized to the task at-hand. For example, to instantly diagram the path of an application, users can just enter the source and destination addresses. In this fashion, a dynamic network diagram tool is like GPS for the network – instead of an atlas of maps, users can get a customized map from simple input. Traditional network topology diagrams are icon-driven so only a static image identifies each device. With dynamic network diagram software, every element correlates to a mathematical model. As a result, users can interact with the data behind the network map, diagrams can auto-update, and information can be dynamically displayed or hidden by zooming in. A dynamic network diagram is much more than a network topology map. Engineers can interact with it for troubleshooting and change management, providing an end-to-end network management solution that far exceeds a static network drawing. Instead of using the CLI to interact with devices one at a time, users can interact with their network through a visual environment instead. This map-driven approach accelerates troubleshooting by allowing engineers to monitor performance data, analyze historical changes, and automate troubleshooting logic. Network changes can be both risky and manual. 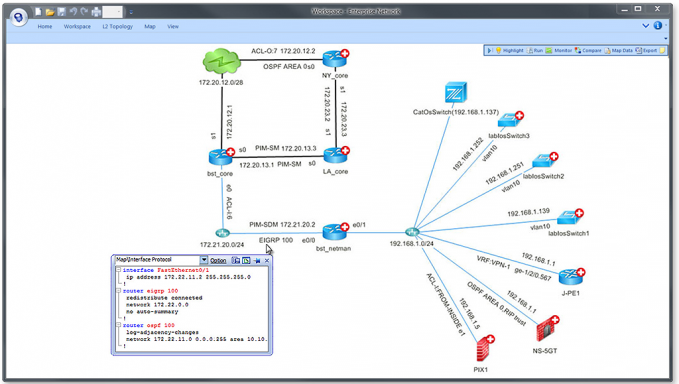 To minimize outages, network changes can be defined with a automated network diagram tool. Through this environment, configuration updates can be pushed automatically and the impact can be instantly analyzed and documented.